The Huskers may have the day off Tuesday, but there’s no such thing as an off-day at Hail Varsity. Our by-the-numbers position preview series continues today with a look at the pass-catchers. The new coaching staff seriously overhauled the wide receiver group, adding five more scholarship receivers to offensive coordinator Troy Walters’ room since they arrived in Lincoln. Add the newcomers to arguably the best one-two punch at wide receiver in the Big Ten in Stanley Morgan Jr. and JD Spielman and that position has the potential to be a significant strength for the Huskers in 2018. The tight end room is a little smaller, but if reports out of camp are true and if Central Florida’s 2017 season is anything to learn from, that position will feature heavily in Nebraska’s new offense. Morgan and Spielman emerged as bonafide stars last season, but that had a bit more to do with sheer volume than overall effectiveness. Quarterback Tanner Lee force-fed those two as much as possible and the result was a record-setting year by both in terms of yard totals. However, there is still plenty of room for improvement in terms of efficiency. Add in highly-touted recruit Tyjon Lindsey who only produced 12 catches as a freshman and that trio caught less than 57 percent of their targets. Central Florida’s top four receivers (excluding Duck-R Otis Smith and tight end Jordan Akins) caught 69 percent of the balls thrown their way. Granted, a lot of those figures have to do with quarterback play. Not every pass listed as a target is easily catchable. McKenzie Milton was a Heiman candidate last season and Lee was, well, not. Part of that too was Lee’s protection as he was pretty good at hitting his mark when he had time and space. All of that is to say this isn’t just on the receivers. That being said, for the offense to run like Scott Frost wants it to, the wideouts have to be more consistent. They have to create separation with their routes and they have to hold onto the ball. As good as Morgan has been, he has had his inconsistencies in terms of catching the ball, especially on 50-50 targets. 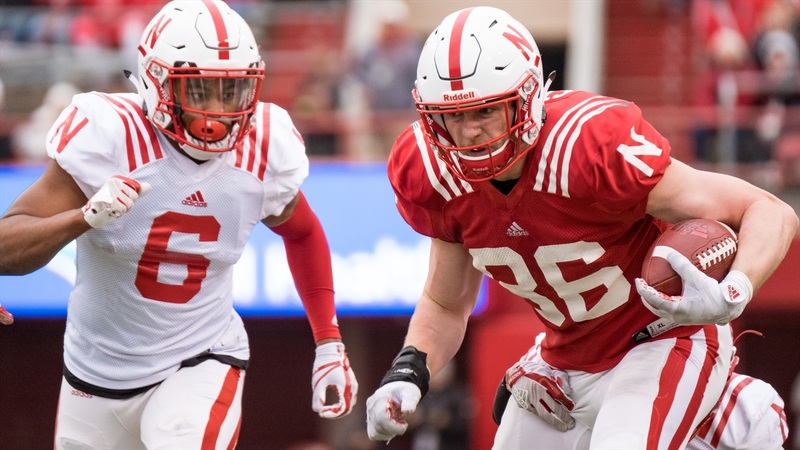 Lindsey simply wasn’t a great fit for Mike Riley’s offense and he admitted he wasn’t ready to contribute right away when he got to campus, but Nebraska is hoping for a breakout season from the sophomore. Nebraska needs a third receiver to emerge and that could be Lindsey based on his talent and skill set. Last year, walk-on Tyler Hoppes set a single-season receptions record for a tight end with 34 catches for 377 yards and three touchdowns. Hoppes is gone, but Nebraska will hope to get similar production out of his successor, which appears to be Jack Stoll at this point. At Central Florida last year, three tight ends played in at least 12 games, and all three caught double-digit passes. However, Akins (6-foot-4, 262 pounds) caught the lion’s share of those passes with 32 in 12 games himself. Central Florida’s offense was far more dynamic than Nebraska’s last year and that shows up in the averages of most of the receivers, and Akins was no different. He averaged five more yards per catch than Hoppes did. Clearly, though, the tight end is a major weapon in Frost’s offense and Nebraska needs Stoll to emerge as that go-to target. He is listed at 6-foot-4 and 260 pounds, which is right in line with what Akins was for Central Florida last season. Known as more of a blocker than a receiver, Stoll’s opportunities were limited last season behind Hoppes and senior Connor Ketter. However, when he did see the field he made the most of it, catching eight of his 11 targets for 89 yards and two touchdowns. Any time tight ends coach Sean Beckton was asked about his position group during the spring, Stoll was the first name out of his mouth. Look for Stoll to have a breakout season in 2018, perhaps even a record-breaking one.